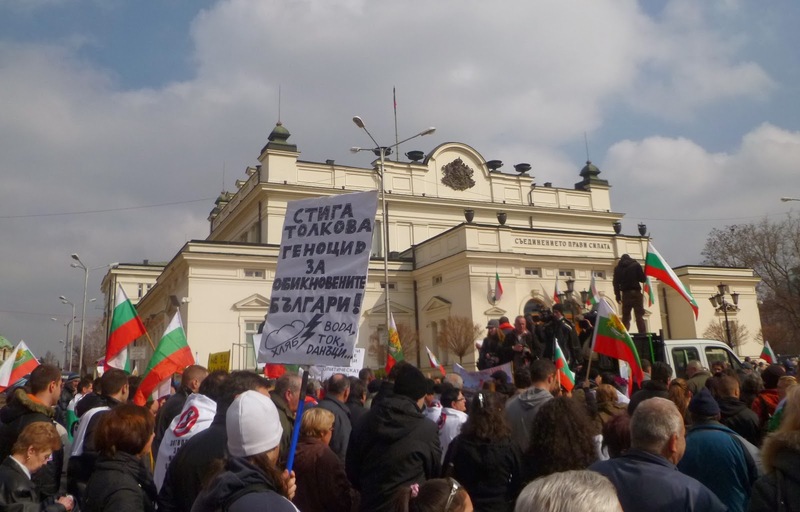 Brandon Turbeville: Bulgaria Protests: True People Power or NGO Operation? Only a few months afterward, the Bulgarian Parliament appointed Delyan Peevski as the head of the State Agency for National Security. This act alone caused a reaction of disgust and anger amongst many Bulgarians which resulted in an immediate resumption of mass protests and demonstrations. This is because Peevski is largely viewed as the epitome of the problem in Bulgaria – nepotism, corruption, abuse of power, and political thuggery. Peevski’s family owns 40% of the print industry in Bulgaria and his mother is the owner of the national lottery. Peevski himself is involved with the administration of the media empire belonging to his family. He had been appointed to political positions once before, when he was made Deputy Minister of Disaster Management Policy but was removed from that position due to corruption and scandal. After the demonstrations resumed, Peevski resigned. However, the protesters remained in the streets to demand early elections, not so much angered by the individuals in elected positions as much as angered at the state of the entire political system. These demonstrations, which also numbered in the hundreds of thousands, prompted violence to break out between demonstrators and police with members of both groups being injured when all was said and done. Ever since the height of the protests, Bulgarians have been protesting in the streets of Sofia with varying numbers of participants. As of late, however, protest attendance has been waning, hence the staging of what organizers hope to be a fresh infusion of anti-corruption fervor and a shot in the arm to the Bulgarian protest movement. Still, the Bulgarian protest movement’s demands are somewhat unclear and undefined. Beyond the resignation of the Prime Minister and vague calls for “accountability” and an “end to corruption,” the movement appears to lack everything except anger and dissatisfaction. Such movements are always easy prey for those who would seek to co-opt them, much like the Occupy movement in the United States was co-opted very early on by Foundations, NGOs, and other nefarious actors seeking to use hordes of swarming adolescents to advance their own agendas. Indeed, such co-opting is already beginning to take place in Bulgaria where organizations and NGOs are already “siding with the people” and attempting to foist their agenda onto the protesters as if they were the demands of the movement and the Bulgarian people all along. That is, if the protesters were not arranged by the NGOs from the beginning, a possibility which is still unclear even five months after the initial protests. Clearly, however, Bulgarians have a legitimate complaint. Bulgaria remains the poorest state in the European Union and, as the worldwide economic depression entrenches itself across the globe, the situation only appears to be getting worse. IMF-style austerity programs and privatization schemes (electricity is provided by private companies, many of whom are based outside the country) are still implemented in order to loot what little Bulgaria has left in the public coffers. To make matters worse, the country is plagued with a deep-seated corruption that runs from the top of the national government down to the smallest local level, making change all but impossible. In addition, the burden of anti-logical CO2 Credits has contributed to the economic plight of Bulgarians and rising energy prices. Both the Bulgarian Helsinki Committee and Access To Information Programme are closely associated with George Soros’ Open Society Institute and derivatives of that organization. BHC also receives sizeable donations from USAID, a notorious American intelligence front organization designed to foment cultural and political destabilization in foreign countries. The Institute for Market Economics also works closely with the Open Society Institute as well as Freedom House, National Endowment for Democracy, USAID, and the World Bank. Ironically, the IME is a neo-liberal organization which promotes the insane austerity methods of the Austrian school of economics and the privatization of public services at vastly increased costs to the consumer and the average Bulgarian. Indeed, the irony is that the protests were originally set off as a result of skyrocketing electricity bills due to just such a privatization scheme. Now, the IME wishes to attach itself to the Bulgarian movement and push one of the very plans which prodded mass numbers of people into the streets earlier this year. Undoubtedly, such organizations as the IME, BHC, and AIP will rally support by railing against the Communist holdovers still operating in Bulgarian government structures -- an easy sell since the corruption and repression of the ruling Communists were evident enough in every strata of society. Indeed, forced labor camps remained in existence in Bulgaria under Communist rule well into the late 1980s. However, while the widespread corruption of current Bulgarian officials must be dealt with by the Bulgarian people and real demands must be made, Bulgarians would be wise to avoid any and all association with the aforementioned organizations. Failure to do so will not only wrest control of their own movement away from them, it will undoubtedly bring something much worse in the long run than the current political scene. Tarpley, Webster Griffin. Obama: The Postmodern Coup-Making Of A Manchurian Candidate. Progressive Press. June. 2008. Todorov, Tzvetan; (tr. Robert Zaretsky) (1999). Voices from the Gulag: Life and Death in Communist Bulgaria. University Park, PA: Penn State Press.